The research phase for this article didn’t go as I originally expected, to be honest. It only means that I’m getting at something here. Hire Me pages are something that started sprouting up a couple of years ago. Instead of going the usual monetization route — products, affiliate stuff — bloggers began offering services to clients directly. A lot of freelance careers have been launched like this, including mine. But as it turns out, the traditional Hire Me page approach doesn’t appear to be something that’s used in the world of SEO freelancing all that much. The usual strategy used in spaces like freelance writing (eg. 1, 2, 3) is to focus on saying a few words about yourself, add a picture, list your clients, provide some testimonials, and then conclude it all with a nice contact form. However, I’m quite surprised to see that successful SEOs seem to opt for a more hard‐sell type of an approach. For the most part, Hire Me pages for SEO services tend to look more like sales pages than anything else. It’s a completely custom page created to highlight his offer. The overall look and feel resembles a standard product page. 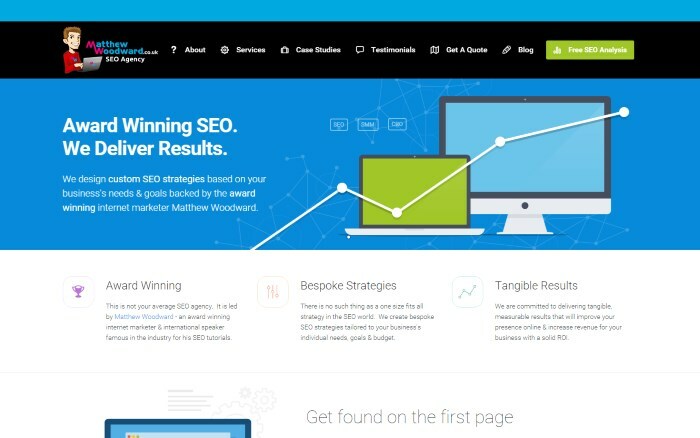 Matthew’s site is just one example to illustrate what I mean, but I’ve observed a similar scenario with other SEOs and their pages (eg. 1, 2, 3). I have a theory on why this might be the case … on why this product‐like approach seems to work well for the SEOs using it. The theory is that potential SEO clients care more about the service being delivered, than they care about the person delivering it. In other words, unless you’re a highly recognizable expert, your name carries relatively little weight in comparison to your ability to write effective copy. That’s why sales pages are perhaps more effective than standard, honest blog‐post‐like messages from the person behind the Hire Me page. One of the most effective selling tactics out there is to showcase proof that what you’re doing works, along with a group of happy clients sharing their testimonials. Well, in SEO, this isn’t always possible. In most cases, you can’t just openly list your clients and say that you gave them, say, #1 spot for keyword X. Clients don’t like their information getting public because they risk losing their Google spot, or exposing their techniques to competition. At the same time, publishing anonymous testimonials seems like a weird and shady thing to do. In such a rather hostile environment, the only thing you’re left with is indeed your own selling skills. Let’s go through the elements one by one. Please keep in mind that you probably don’t need every single one of them on your Hire Me page, but it could help. Every element on your page should be designed to increase your conversions (more on what to offer in a minute). In other words, if some element isn’t meant to either ensure your prospective client that you’re the person for the job, or sell them on your offer directly, then it has no business being on the page. Most WordPress themes these days allow you to use landing‐page templates for individual pages on your site, or at least full‐width pages, so this part shouldn’t be a problem from a technical point of view. If you can and want to publish client testimonials and a portfolio, please do. There’s hardly anything else that’s better at proving that you know what you’re doing than your happy clients willing to share a word about their experiences. Just make sure to get testimonials from people who are a good representation of your desired client base. For instance, if you’re targeting corporate clients, testimonials from little‐known small business owners won’t do you much good. If testimonials aren’t an option (hey, maybe you’re a grey hat SEO … we don’t judge) then you need to find another form of proof. As they say, features tell, benefits sell. Talking about the benefits is really about getting to the bottom of what an individual client can truly gain when working with you. Saying something like, “get #1 spot for your keyword” is kind of vague at this point, and it doesn’t set you apart from the competition much. Instead, try going deeper and pinpointing what a good spot in Google could actually mean to your client and their business. For example, you could present some example calculations of traffic vs. sales for someone running an e‐commerce store (if that’s your target). Showcase this as a chart. Or go even more visual and use a video. Now that the client already knows the benefits, it’s a good moment to talk about the details of what you actually have to offer. A good way to go about this is to specialize. Make yourself appear like a big fish in a small pond, rather than the other way around. For example, do you do local SEO? Social media? Link building? On‐page optimization? Or let’s take a different angle. Do you work with e‐commerce stores? Small business sites? Blogs? Whatever it might be, you need to say this openly and be as direct as possible. For every client you alienate (by excluding them from the picture), you’re effectively convincing someone else that you’re just who they need. Optional. You can try listing your prices, but I wouldn’t advise it right from the get‐go. You will alienate some of your potential client base that way, so it’s not always a desirable scenario. In the end, how much you charge doesn’t matter that much for your marketability. Browsing through the rates at PeoplePerHour convinces me that the market can accept anything from $10/h to $100+/h. Putting a big buy button on your page will probably not work that well. Even if you’ve done your selling right, and your client is convinced about your skills, you still can’t just sell them a service. Everyone’s situation is different, so some form of individual approach is a requirement. Try making the offer itself as straightforward as possible — make it a button or a form with just a minimum number of fields. Finally, split testing a standard contact form against this free offer can’t hurt you. Giving away something for free should work better most of the time, but you should still test it against a more traditional approach. Should you use long copy or short copy? As much as I hate saying this, it depends. In general, for services/products that your client base can clearly understand, you don’t need long copy. For instance, if you’re offering your SEO services to people who already know what they want exactly (eg. they know what kind of link building they need and how much of it), then short copy listing just the most important details will be enough. For a more beginner client, on the other hand, long copy will help them get a better grasp on what’s being offered and if it’s right for them or not. We did talk about those recently, but that piece was more centered around the methods rather than the volume of what’s being done out there. So let’s dig a bit deeper here. 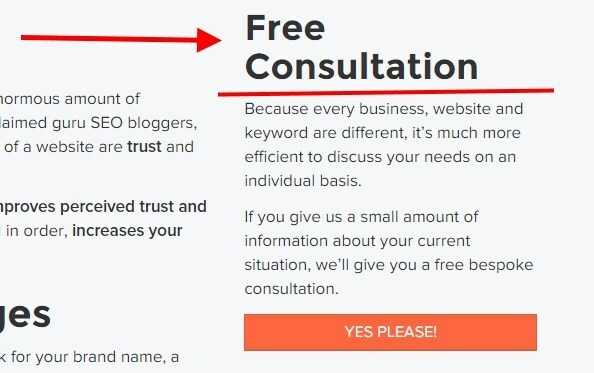 The main question is: should you guest post to promote your SEO services? Not to keep you waiting, I truly believe that the answer is a simple yes. A strong yes. 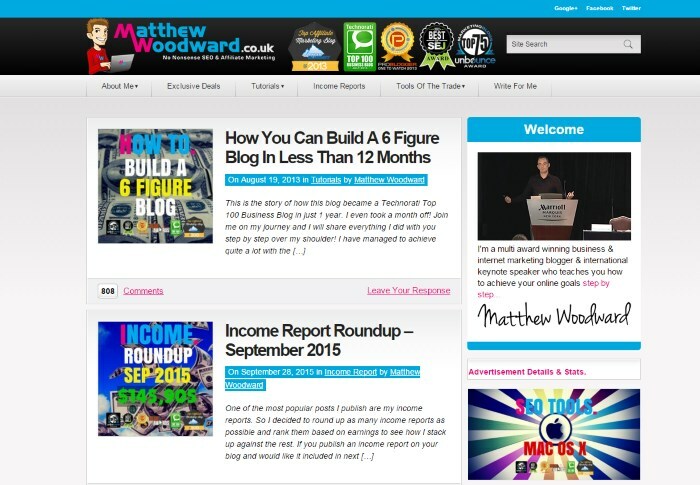 It gives you credibility and allows you to say that you’ve been featured on a leading industry site. It sends you direct traffic if you’re posting in the right places. Those are usually not industry sites — like Search Engine Land — but rather sites where your desired client base hangs out. 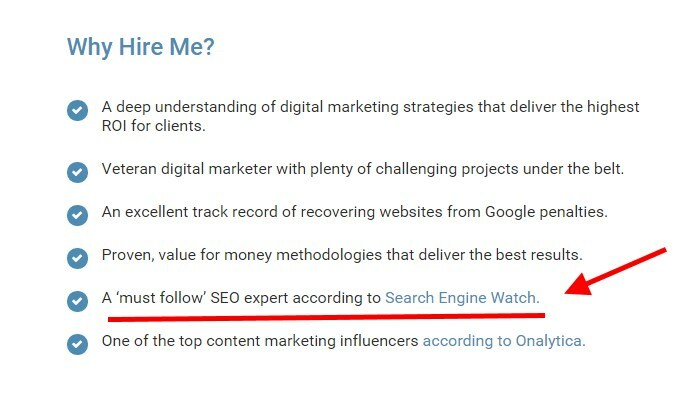 It participates in your link profile, which has an impact on your Google rankings, but you already know that. Let’s see if anyone’s using guest posts as a method of promotion. Now, some industry websites offer their contributors custom author pages or author listings. We can follow these listings to see who’s guest blogging and where. Actually, the only thing you need to do to perform this kind of research is google a person’s name. 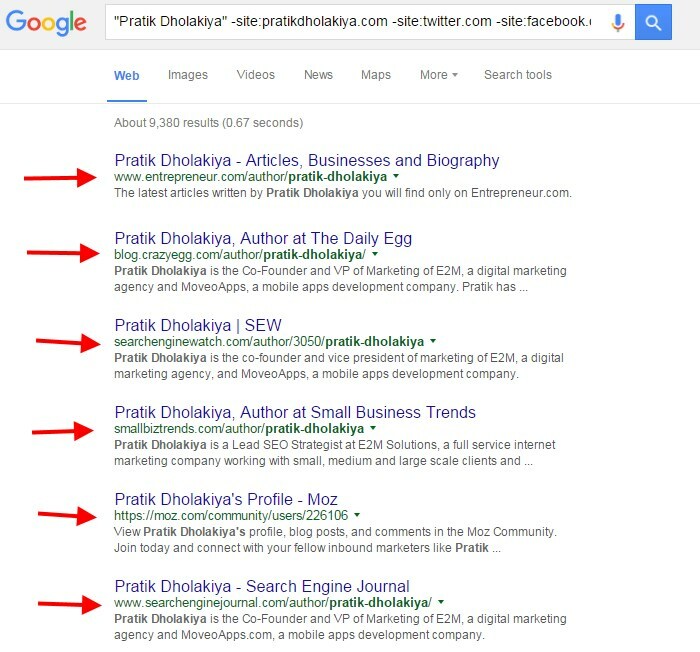 This gives me an impressive list of Pratik’s profiles on sites like, Entrepreneur.com, Search Engine Watch, Crazy Egg, Moz, SEJ, SmallBizTrends.com, and a handful of others. Is guest blogging worth the effort when it comes to growing your SEO career? You be the judge. Resonate with the exact type of client that you’re targeting your offer towards. Avoid distraction. Whatever’s on the page should be aimed at generating conversions. Offer something for free, something that the person can use right away. Establish your credibility and provide proof. Convey the benefits of working with you and explain what it is that you do exactly. Then, you should promote that page just like you would promote any other product. However, this time, the product is you. What’s your take here? Have you built yourself a nice Hire Me page yet?